Chaudhry Shujaat Hussain is a famous Pakistani Politician; he belongs to a Jatt (Warraich) Family of Gujrat, Punjab. He was the Interim Prime Minister of Pakistan for only about 2 months (30 June, 2004 ~ 28 August, 2004). Ch. Shujaat Hussain is son of a great politician Ch. Zahur Elahi (late), brother of Ch. Wajaat Hussain (Politician) & Ch. Shufaat Hussain (District Nazim of Gujrat) and cousin of Ch. Pervez Elahi (Ex. Chief Minister of Punjab). His family is called as Chaudhry’s Family of Gujrat. 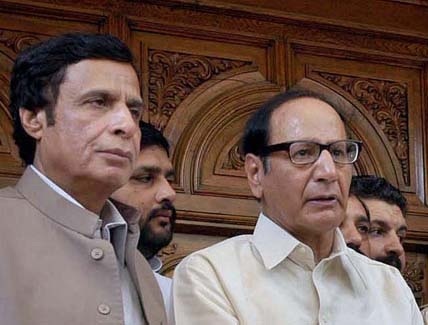 Chaudhry Shujaat Hussain came into politics in 1982 after the assassination of his father. He has proved himself a more respectable politician among public and other politicians too. Currently he is “President of PML-Q”. He has served as 20th Prime Minister of Pakistan, Federal Minister of Information, Federal Minister of Industries and Production and Federal Interior Minister during different intervals. He was selected as member of Majlis e Shoora of General Zia ulHaq (Ex. President of Pakistan). He also served as Parliamentary Leader of PML-N in National Assembly. He is also Honorary Consul General of Republic of South Korea since 1982. How toContact Chaudhry Shujaat Hussain? Phone number and Email Address of Chaudhry Shujaat Hussain are not still available.